People who suffered complications from Bard Sepramesh IP Composite Hernia Mesh products are seeking lawyers for filing lawsuits against the manufacturers, claiming the devices were defectively designed and caused them serious injuries. There may be large cash claims from settlements in these Bard Sepramesh IP Composite Hernia Mesh lawsuits. Hernias occur when an organ or fatty tissue pushes through a weak spot in the surrounding tissue. The most common types of hernias occur in the inner groin (inguinal), outer groin (femoral), belly button (umbilical) or upper stomach (hiatal). Some hernias can occur as a result of surgery (incisional). To repair hernias, surgeons often use a mesh or patch to reinforce and provide support to the weakened tissue. National Injury Help is accepting cases from those injured by Bard Sepramesh IP Composite Hernia Mesh . If you or someone you love was injured as a result of these products, you may be entitled to financial compensation. While it’s still too early to see what the compensation for the hernia mesh lawsuits will be in past defective medical device lawsuits have paid out hundreds of thousands of dollars to victims from court ordered settlements. Three recent questions about the Sepramesh mesh lawsuits. How much can you get from a Sepramesh mesh lawsuit? How much compensation would I get from a Sepramesh mesh lawsuit? How much are the settlements or payouts in the Sepramesh lawsuits? Some of the defective medical device lawsuits have had millions of dollars in a compensation fund, and then that is divided up between all who have joined the lawsuit. Example: $50,000,000 in a settlement fund that would serve 1,000 victims would be $50,000 per person. This is only an example and does not represent what may happen for Bard Sepramesh product. Manufactured by: C.R. Bard Inc. subsidiary Davol Inc.
Sepramesh was originally manufactured by Genzyme Corporation, a biotech company acquired by pharmaceutical giant Sanofi in 2011. In 2007, before the acquisition, C.R. Bard announced it had entered into an agreement with Genzyme to manufacture and market the Sepramesh product. Bard said it would begin marketing Sepramesh immediately and that it would incorporate the Sepra® technology into future mesh products of its own. The first Sepramesh product was approved by the FDA in March 2000 through the agency’s 510(k) clearance program. This means the makers of Sepramesh (Genzyme at the time) did not have to perform rigorous clinical tests to ensure their mesh product was safe and effective. They only had to show that Sepramesh was similar enough to another mesh product already on the market. The first Sepramesh was approved using the Bard Mesh and Bard Composix Mesh as predicate devices. Even though the Sepramesh was made using different materials than these other meshes, it was approved with only laboratory tests and one animal study to back it up. The Sepramesh IP, approved by the FDA in 2004, is a modified version of the original Sepramesh device and contains additional materials. Like its predecessor, Sepramesh IP was approved without rigorous clinical testing to make sure it was safe and effective. What is this Sepramesh hernia mesh made of? The PEG side is coated with an absorbable hydrogel made from sodium hyaluronate, carboxymethylcellulose and polyethylene glycol. The coating is meant to keep other tissues and organs from adhering to the mesh during the critical wound healing period following surgery. It is slowly absorbed and excreted by the body – usually within 30 days, according to the original Sepramesh 510(k) approval summary. The side that is not coated with the hydrogel allows tissue to grow into the mesh in order to provide support to the weakened area. Bard’s Sepramesh IP has been associated with many common complications of problematic hernia mesh brands. At least 50 adverse event reports relating to Sepramesh and Sepramesh IP have been submitted to the FDA by doctors, patients, and attorneys representing those patients in lawsuits. Some of the most recently submitted reports involve complications with the Sepramesh IP. A report submitted last August indicated the Sepramesh IP had adhered to the patient’s colon, which surgeons discovered when performing a revision surgery to fix a recurrent hernia. Another report submitted in January 2016 detailed a patient’s horrific experience when he was implanted with three Sepramesh IP devices to fix a hernia caused by a previous surgery. The report said the Sepramesh had created a hole in his small bowel and eroded into his small intestine. At least one of the pieces of mesh became infected, another attached to his liver, and surgeons had to perform three separate bowel resections in an attempt to fix the problems created by the Sepramesh products. Has this hernia mesh been recalled? 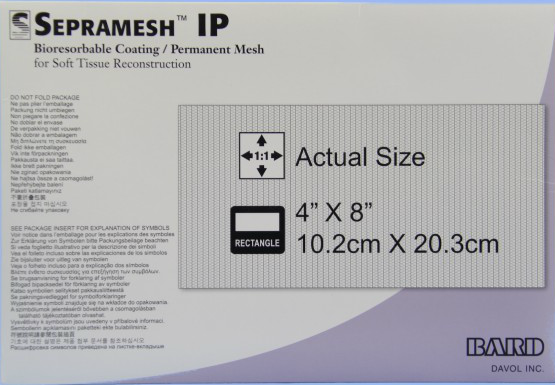 The Sepramesh IP has not been recalled and continues to be sold and used today in hernia repair surgeries. Bard Sepramesh IP hernia mesh lawsuit lawyer claims & settlements page updated on April 10, 2019.